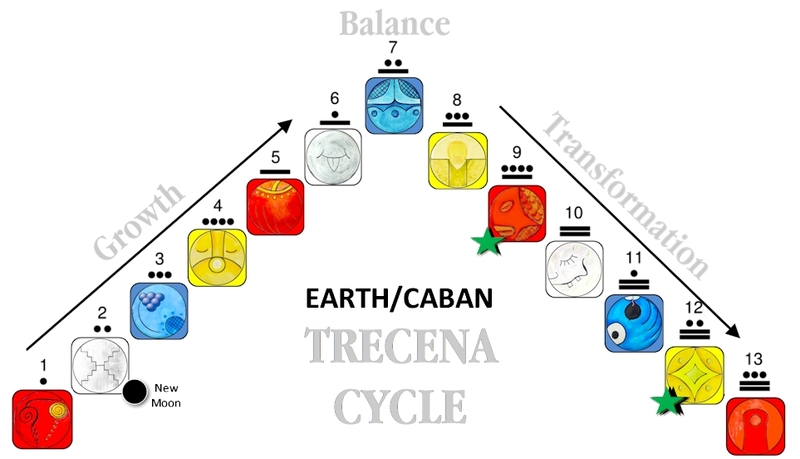 The Earth/CABAN trecena guides a Transformation of Discovery. Earth is the source of all Human knowledge. From the macro to the micro, she tells a story of the Divine Design. The Wisdom of experience is a result of her movement. This phase of our Spiritual Growth will be a Discovery of our Oneness with Mother Earth. Made of Earth, we can know our Self by her matter, her forces of nature, and her movement. The most ancient Spiritual Principles define our world as a mental construct. We all live in a world of our own perception. We can either see things as possible or impossible. We can recreate our world by changing our mind. Crocodile/IMIX is the Day Sign that influences our way of thinking. IMIX inspires us to use our Imagination. Tone 5 is a day of Empowerment. We are empowered to manifest new Truth through the faculties of our mind. Tone 5 magnifies the influence of IMIX, as 5 relates to our Human Intelligence – the ability to organize our thoughts. We are given an energetic push to see things through a new state-of-mind. 9TH UINAL: Over the course of the next 20 days we’ll see things in a new way. 9 holds the Intention of Patience to see the bigger picture. Completions are all-important to the number 9, warning of the potential for suffering if we fail explore our Truth more deeply. 9 is a Peak number of Transformation by revealing a Meaning and Purpose. The 9th uinal is the place of budding in the harvest cycle of the Tzolk’in round. We will be able to see the evidence that we are intended to blossom, holding the seeds of a new generation of Spirit. The Maya recognize the God of Light as the leader of the 9th uinal. The feathered serpent known as Kulkulcan (aka Quetzalcoatl) is the Light that descends along the steps of the pyramid of Chichen Itza. The 9th uinal transforms our perspective through inspiration from Above. Crocodile/IMIX is the Dawn of a new Awakening. IMIX is the primordial Mother, present at the birth of Humanity. She is the Divine Mother of Compassionate and Protective Love. Her passion is to teach us to be Happy and to Love One Another. She encourages us to be all that we can be, offering the Inspiration for Creation. IMIX is the Day Sign of Innovation and wild ideas. On days led by IMIX we might take note of random ideas that seem to come out of the blue. This is a good day to recognize the presence of your Inner Voice. Where does the voice come from that seems to interrupt your thoughts of something else? This is a day when our thoughts are likely to be all over the place. IMIX shakes us out of our routine train of thought. Our Human Nature depends on our mind of Reason. To become a Creator requires us to use our imagination. We have to see our Creation as if it’s already been created. IMIX persons are said to be Genius when they follow their heart. 5 Crocodile/IMIX is the Destiny Kin of Thomas Edison, born February 11, 1847. Imagine all the hours he spent dreaming about his next experiment. When our Intellect is balanced with our Imagination, we have the faculty to explore our perceptions of the world. IMIX asks us to see ourselves and the world through her eyes, to see the Beauty, Intellect, and Unlimited Potential that she sees. Last night I had the privilege of attending my second grandson’s first musical performance. He is beginning his discovery of the world in his first year of pre-school. He’s excited about school and says, “I already have 5 new friends!” The musical production was called a “Festival of Light,” and was a multi-culture event celebrating culture and tradition from around the world. His class performed a song from India’s Festival of Lights. Other classes shared the Christmas traditions of Sweden, Mexico, Germany, and another shared the Jewish traditions of Hanukkah. The innocence of children is a such a thing of beauty. Their eyes are still open to all the wonders of the world. They celebrate the simple joys of knowing each other. My grandson reflected his pride in his “first rite of passage,” holding a candle as his class filed by. For the most-part it was a performance of indistinguishable words and melodies. 🙂 Some voices were barely heard, and others so loud they were heard over everything else. Parents dabbed away the tears of seeing their children’s first artistic performance. The Maya describe Mother Earth as having the beating heart of a Mother. The Jaguar can hear it in the sacred sites and temples. A Divine Mother shares the heartbeat of her children. She feels the joy and the heartbreak as if it were her own. I couldn’t help but feel my grandson’s excitement and his pride of accomplishment. It’s funny how we want to grow up so fast, then spend years trying to recapture the mind of innocence. IMIX is the Mother that believes in and celebrates our dreams. Our Human suffering is a result of an illusion that there’s “not enough to go around.” If we look again, we could see that the things that really matter are unlimited and free. When we see the world as a place of unlimited abundance, sharing will come naturally. IMIX also demonstrates a way of being. Everyone can use the Love of a Divine Mother. We can be sensitive to the needs of one another, and share both the joy and the sadness. We can offer the encouragement of a Mother’s Love who believes the Dream that can come true. They can, against all the odds of reason. To all my relations, may we our Dreams be Empowered by wild ideas and thoughts out of the blue. May we embrace the gift by exploring it through our imagination. My we eliminate our own suffering, by claiming the Truth of Abundance in the world. And, may we Acknowledge an Inner Voice of Spirit. May we celebrate the Dawn of a New Awakening of the Power of our Imagination. I’m grateful that we can organize our thoughts, change our minds, and employ our imagination to make a dream come true. I am grateful for the cold and dark of December. Doors open! Ah… I remember Tucson winter nights sleeping with windows open.